Needless to say, I dropped my toothbrush and asked him what he meant. He put his hand on the upper left side of his abdomen and said, with a worried look, “It hurts right here.” I knelt down in front of him, and lifted his shirt. The area he was indicating was roughly where his remaining kidney is, so my heart started beating a little faster. I asked him to describe the pain. We stare at each other a bit. I tentatively ask if it still hurts now, since he is looking pretty much ok. Both Martin and I have hay fever and have been suffering with it a bit recently, and were wondering if Elliot would eventually have it too. Elliot: “Yeah instead- tins! And now the air has made a hole!” His eyes open wide with the dramatic intensity of his prognosis. I ask him a few more questions, and find out that he just ate a huge lunch before deciding to jump around on the sofa. I am starting to get a glimmer of a possibility. Oh my poor sweet little boy. I wondered at the beginning, when he was diagnosed, if there would be any psychological side effects, and hoped that because he was so young, he would not be too affected. But, resilient though he is, he knows what’s going on. Not too long ago, on a day we had to leave for the hospital, he was in tears as usual, resisting my attempt to get his shoes on, saying he needed to watch “just one more tv show” and eat “just one more snack” and then he would be ready to go. We insisted, explaining patiently for the millionth time that this treatment was essential to making him better again. He looked at us with big tearful eyes and said “Why did I have to get this? Why couldn’t I get an illness that was easy-peasy?”. He knows that cancer isn’t easy-peasy. He worries about the treatment, about how he will feel after the treatment, and about whether the cancer could recur. Just like we do. I wanted to spare him all that by always acting optimistic around him, never showing him just how scared I was too. But he’s figured it out anyway. A few nights ago I went in to check on him as he was sleeping. He had been wheezing a bit, so my mom-radar was on. He’s always had a bit of asthma so I knew it was probably nothing unusual, but I wanted to check on him anyway, because well, that’s what I do. Worry and check. Check and worry. He looks so innocent as he sleeps there, curled up on his right side and snuggling his polar bear. I put my hand on his chest to feel him breathe. On his upper right chest, just below the shoulder. Elliot had lung tumours in that area. Well, he had lung tumours everywhere. Lots of them. But the chemo made them all shrink. This feels hard, like bone. I am breathing faster and can feel my heart beating, but I tell myself that it’s just because of the position he’s in. I move him down onto his back so he is lying flat, and feel for it. Still there. I feel the same spot on the other side, on his upper left chest. No corresponding bump that would somehow make me think this is a normal part of his anatomy. My heart is pounding in my ears now, as I sit there in the dark. I feel covered in icy sweat. I keep feeling back and forth between the upper left and upper right side. There is no doubt: he has a hard lump on the right side, the size of a quarter. Panicking, I turn on the bedroom light and lift up his shirt. Elliot wakes up groggily and mumbles something about leaving him alone. And two things happen simultaneously: I see the port-a-cath bump on his chest and realize there’s no lump. The port-a-cath bump. The same bump that has been there for the past 10 months, ever since the operation to install the port-a-cath, through which he receives chemo. The same bump that I see every day when he gets dressed, when he bathes, and of course when they do the chemo. The bump that feels just like a hard, quarter sized lump. He looks at me with a sleepy smile, pulls down his shirt and rolls onto his side, snuggling closer to his polar bear. “Can you turn off the light when you’re finished please?” he mumbles, and then he’s asleep again. So I flick the switch and sit there in the darkness for a while, my breathing still fast, my head swimming. There’s no new lump. The treatment really is working. When does the fear go away? Is it in a couple weeks when we get the results of the end-of-treatment scan, telling us we are “officially” done treatment and only need to come back in three months? Is it only after that two year post treatment milestone, knowing how unlikely relapses are after that date? Is it when he’s a teenager and comes home safe after a night out with friends? Is it when he moves out and starts his own life as an adult, no longer our child to worry about? My mom has been surviving cancer for 12 years. She has CT scans every three months, and every time, there must be a bit of the “what if” fear. But she never shows it, at least not to us, her kids. How do you live every day without being overwhelmed with worry? And yet, life involves risks, every day. When I strap Elliot into his car seat, I never think about the risk of a deadly car accident, and yet, the lifetime odds of a car accident are 1 in 4. Odds of dying from a car accident are 1 in 100. The statistics for Elliot’s cancer: 1 out of every 10,000 kids will get this, and the cure rate for those is roughly 80%. So, statistically speaking, I should be more worried about the drive to the grocery store than the cancer. But that is not how our brain works. 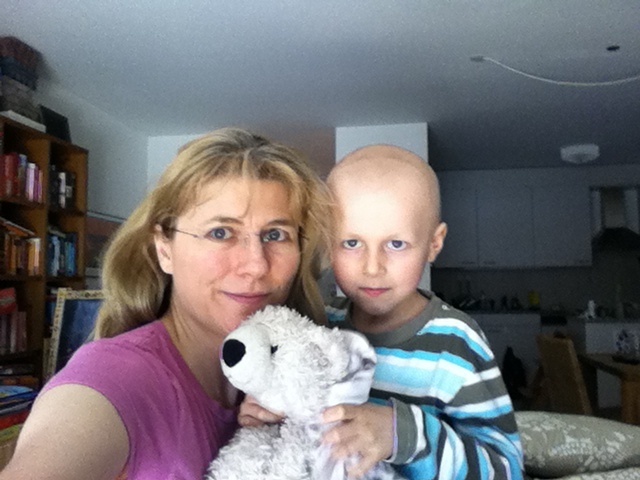 I wrote not too long ago about courage…(http://nicolescobie.com/?cat=16). I realize now that not only is it important to face fears during moments of crisis, but also in the long term, and every day. Life equals risk. As I was looking up those statistics earlier, I came across one important fact: your lifetime risk of dying is 100%. We try to ignore that fact, but there it is. Is there a way to turn that fact into a good thing? Maybe. It’s a reminder of how precious our time together is. While I write this, Elliot is snuggled under a blanket on the sofa, cuddling his polar bear. Today is a chemo day. I guess I’ll go snuggle with him. Hang in there Nicole ! Bear hug ! Sorry you all have to go through this, I wear my yellow bracelet for children cancer every day, thank you for sending it to me. Powerful post, Nicole. Enjoy the snuggling. Oui, on a toujours peur! Chaque fois qu’on a un nouveau mal, un symptome inhabituel Et chaque fois qu’il faut passer un scan, aller voir les resultats. Mais on s’habitue, et a la longue, on voit chaque nouveau soleil, chaque fete, chaque nouvelle annee comme autant de belles victoires! Et on se voit a 100 ans!